Tornadoes are associated with deep convection and severe thunderstorm activity, representing extremely dangerous phenomena. Strong tornadoes, considered those of an intensity of F2 (Fujita scale) or T4 (TORRO scale) or greater, although rarely occur in Greece, however can pose a significant hazard to the community, including property, infrastructure, agricultural damage, injuries even and fatalities. 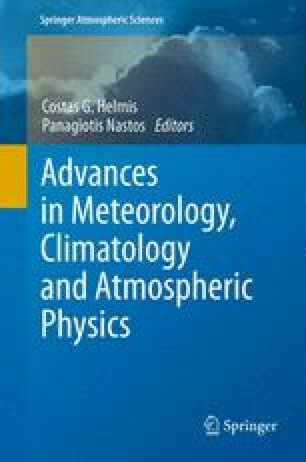 In this study, an analysis is performed of meteorological conditions associated with strong tornado occurrences during the last decade, a period with systematic tornado recording in Greece. Selected cases include a sample of strongest and most damaged tornado cases as have been evaluated in the 12-year Greek tornado database (2000–2011). Synoptic and mesoscale features favourable for the development of such severe incidents, including upper-air patterns, thermo dynamic, wind parameters and convective instability indices, are examined. Thus, a contribution is offered to increase the ability to identify and anticipate such extreme weather events, critical to the mission of operational meteorologists. The authors are grateful to anonymous people, media, services and authorities provided tornado information.